Unfortunately, the title of this post has relatively little to do with the content. I don't like long titles, and I don't like "something, something else, and finally this other unrelated thing" titles, so I just picked something that made me smile, which happens to be the string of Christmas lights I have going around my room. I found the box of lights in my storage hutch, and decided that it's never too early to start getting in the holiday spirit! I also have a Christmas tree, which I will put up probably in November with my mom. I LOVE the holidays!!!!!!! Anyway, the majority of my day was not this merry and bright. This weekend, on Saturday, I was sitting on the subway heading to Itaewon to pick up my winter coat I got in the mail, when my phone screen started freaking out. I'm talking washed out and crazy lines all over the place. Startled, I clicked the lock button to turn the screen off. As soon as I attempted to turn it back on, it decided that it didn't want to work. So, I had no screen. Somehow, I made it to Itaewon and met up with my friends. Since I'd gotten my phone at an on-base shop, I figured I should ask them what to do about this situation. It was actually a very familiar route, since it was the same as going to church, but I got off earlier and headed to the BIG Samsung store front conveniently located on my side of the busy street. I went in and was pointed to the direction of the service center. Of course, since it's Korea, I had to take a number from the "queuing machine" and waited about 10 minutes to be seen. By that time its about 11:40, and since I have to be at work at noon, I started to get a little nervous. I'm pretty OCD about being on time, so I texted Erin to let her know I might be a few minutes late. Well, the lady who helped me when my number was called spoke ZERO English. And, of course, since my phone was within range of it's maker's store, it started working again!!!!!!! I've experienced this phenomenon plenty having worked at Apple, and unfortunately it is all electronics that function this way. I sort of told her my problem ("all black! lines!" with sad face and pointing at the phone); she typed in a bunch of info and got my name (of course, written on a scrap of paper for her to be able to type in). Then I was shuffled onto the next waiting area, where I sat for about 20 minutes. I was seriously anxious by now, since she had taken my phone and I now have no choice but to wait. I was getting to the point where I wanted to just find my phone and get out of there, but just at noon, a young man came over with my phone in his hands and said "they gave you new phone!" I was stunned! For one: I hadn't really told them anything. Two: they did not ask me to fill out any paperwork at all or even check with me that it was okay to replace the phone. But, it saved me time and I took it (two hands, of course!) and practically ran out of the store. So, I've been emailing with a nice fellow about a 32gb iPhone 4 and I have plans to meet him on Wednesday at the mobile phone store to ensure the phone can be put on my account without any problems!! I am sick of dealing with it and I just want it over and done with. Well, then work happened, and any good feelings I'd had about getting my phone replaced disappeared. I found out, along with a bunch of work this week, I have tons of extra work to look forward to in December. And to top it all off, I found out I have to work on Christmas Eve. I am officially pissed. It's a MONDAY for crying out loud!!! Ridiculous. I could understand if it was a Friday or something, like just even out the week, but no. Let's make you come in after a weekend for ONE DAY, right before the BIGGEST HOLIDAY in your culture, and make you work. I doubt any of the little hoodlums will show up anyway... Bah humbug!!!!!!! It was just a Monday, really... lots of work to look forward to, no one really wants to be back at work, etc. However... I got a letter from a ZTA alumna that has been so sweet in keeping up with me while I've been gone. And I got what I call a little "happy" (aka: a small gift that serves a single purpose - to make someone happy!) It is a ZTA workout headband thingy and it's awesome! Thanks, CBP!! 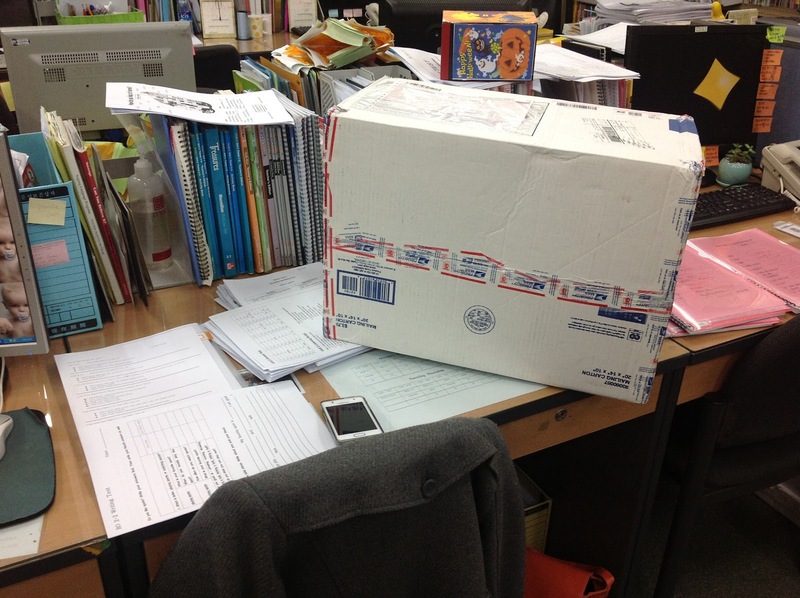 And, after a long day of tests, I walked into the teacher's workroom to find a MASSIVE package on my desk!!! I was absolutely shocked!!! I read the tag, and it was from my good friend Adrian! 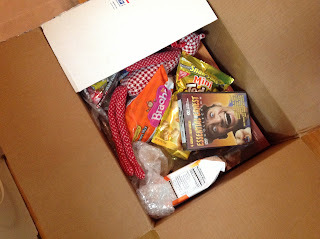 He had told me he was sending a care package but it totally blew me away! I didn't open it because I knew carrying it home would be hard if it had been opened. I got home and sifted through all the loot. He sent some candy, some candles and some candle holders, snacks, a DVD set, a stuffed animal and a GNOME. 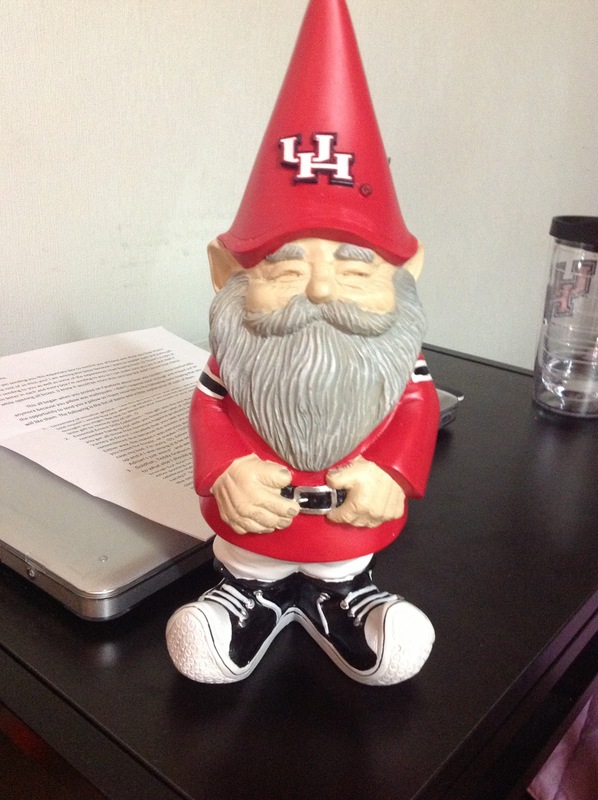 Yes, a gnome. It's hilarious and I love it. I'm not sure where to put it yet, but I'll find somewhere! Coming home at last feels so nice. Today was just a hard day at work, not really due to anything! Getting used to that worked-to-the-bone feeling... but, as Mom always recommends, just take one day at a time!! Awesome! I love so much about this post: 1. You are positive. 2. You got your phone taken care of! and 3. You received a surprise box full of fun stuff. But I am boggled that you have to work on Christmas Eve. That's a head scratcher, as this is a very christian country since the Korean War and all the missionaries that came with it. Hmmm... I just don't get it. I'm happy your friend Adrian sent you a surprise box! He did well!! I wish I was as creative. I don't know what to send you! But a Christmas gift will definitely come from your Mom when she gets there. Love you! I meant a gift from me! She will be BRINGING it to you!